Using Git to move the code base of a Drupal site from a local development environment to a hosting provider (or vice-versa) is a necessary skill that most Drupal site builders should have. Configuring and utilizing a remote Git repository can be an especially daunting task for people who don't have a strong background with version control systems. While updating the DrupalEasy Career Starter Program (DCSP) Curriculum a few weeks ago, it became clear to me that effectively using Git is a skill that we need to teach our students. We had informally gone over basic Git commands earlier in the program, but feedback from students and potential employers made us realized that students need (and want!) the necessary instruction and materials to get them up-to-speed on using Git to move sites between servers. If you're a listener or <shameless_plug>our podcast</shameless_plug>, you probably know that we've been working with the fine folks at WebEnabled.com for quite some time. They've been the exclusive sponsor of our podcast for years, and we use their development tools extensively with our clients and training programs. So, we are going to take this opportunity to give something back to both the Drupal community as well as our friends at WebEnabled by providing access to our print and video curriculum for moving Drupal sites to and from WebEnabled development servers using Git. 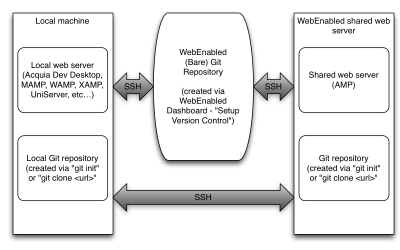 A free-to-download 13-page PDF from the DCSP curriculum that details the various steps required to move a Drupal site from a local machine to a WebEnabled server and vice-versa is included at the end of this post. In addition, we've created two screencasts that demonstrate the process from start to finish; part of the DCSP’s "multi-modal" training approach. Students get maximum training and experience through classroom instruction on all topics (including this one), as well as written curriculum, dedicated time during lab hours where students can work cooperatively, and in some cases, companion screencasts (we're dedicated to having 100% coverage of all our technical lessons in screencast form soon). We feel presenting curriculum in multiple modes greatly increases the success of students to comprehend the subject matter and put it to practical use faster. If you're interested in learning more about the DrupalEasy Career Starter Program, be sure to check out DrupalEasy.com/dcsp or contact us.